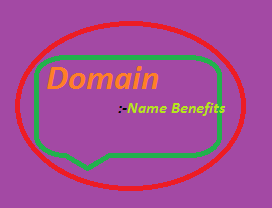 Domain name means .com, .org, .net, .info after your blogspot name may be you can get different domain name. But as a blogger I wanna suggest you to get a domain name from one of these, if you wanna become popular world wide. Otherwise you can get domain name according to your country like for India .in and for other country, it is different. Opportunities from a platform, the domain name can give that platform to grab world of opportunities. People will understand that you are serious about your blog, that's why you are investing money. You can consultant beginners for starting blogging for increasing your earning, reach, authority in the internet world & of course in the physical world too. If you are having blogspot or any other sub-domain blog, then I am 100% sure you are getting that much benefit from search engine, as much you are going to get benefit from search engine, if you are having domain name. Got more back links again green signals for search engines. Invited professional for interview in my blog, here is one of them who earned over $10,000 from Udemy & Proof. Domain name means you have your identity and we both know, if you want do something in our life we must have an identity. The identity can give you the domain name. Domain name means, people will curious about your blog, you have good chance that people will write your blog. And you can do link exchange with other bloggers, you can contact for this with other bloggers, may be you are thinking what will happen if blogger will say no, or will not give answer. You can ask someone to add your blog post link in his or her blog for increasing the users support as well as you will get links. People will trust on you that you are doing some investment in your blog. Sponsors don't like blogspot, wordpress or any other sub domain blog, you can get direct advertisements. I have been asked more than 1000 questions regarding blogging in 2015 through Facebook, E-mail and of course on my blog through comments. I got lot of sponsored blog post to write and many written I just got money for simply clicking on the Publish button, is not that easy. More domain authority as well as page authority of the blog. You can get approval from any ads networks but yes there are some terms and condition followed by networks, it is up to them but probability will be more if you will domain name. Now a days as I face, you can not get adsense account, if you have blogspot or wordpress blog then you have less chance to get approval from Google Adsense. From Google Adsense, you can millions but it is not possible with advertisement programs. Now a days there are many CPM networks they are also paying pretty good for delivering traffic to their advertiser products, websites and you can try one of them. Top publishers are using Adsense, including top news channels, blogs, websites, Yahoo even using Google Adsense. They are paying I think best CPM in the internet most of the time. My recommended Alternate to Google Adsense- I have seen bloggers remove ad networks most of the time when they have started getting lot of traffic and then they moved to affiliate marketing world. Because it is really awesome, even I am using affiliate marketing on my blog that's why I am not using any ad network on this blog. Have these pages- about me, privacy & policy, disclaimer, contact me. If you are Indian for wait for 6 six months that's why your domain name will be 6 months old and you will have traffic on your blog before going apply for Adsense. Ask someone who already got Adsense. You don't need to invest very good amount, if you are investing little amount and you are getting this much benefits. No matter in which country you are living you can get domain for very little amount, this is online it is quiet different from offline business. Actually, its been long time I have been blogging, I have driven lot of traffic to my blogs and in 2016 I am going to take lot of steps to make it happen. Means to get just awesome traffic to my blogs, that's why I am working pretty hard and hard, I know if will work more than any other blogger then I can easily get that space and I am exactly doing the same. If you are from India then it is really easy to buy a domain name in very cheap price, my recommendation to buy domain name is Big Rock & GoDaddy. Hope you are going to enjoy the video and you will learn something new from this video. Domain name for blog is must, reason behind this is no one give serious to blogspot blog, if you think it is not true then find any blog, which is having very good rank and not having domain name. I must recommend you to get domain name for becoming professional blogger.